Adriana Lima's Car: Is There Such a Thing as a Down-to-Earth Supermodel? Supermodels are people, too. At least that's what supermodels would like us to believe. Adriana Lima seems out to prove it. She fell into modeling after agreeing to accompany her friend to a modeling contest. After winning Ford's "Supermodel of Brazil" honors at age 15, and then placing second in the "Supermodel of the World" competition a year later, she moved to New York, and began working immediately. She has gone on to appear on the covers of multiple major magazines including, Vogue, Marie Claire, Harper's Bazaar, ELLE, and Esquire; in ad campaigns for Swatch, Armani, Versace, and Louis Vuitton; and has walked the runway for Valentino, Armani, Givenchy, and Vera Wang. She is most widely recognized for her many years as a Victoria's Secret "Angel", and her work as the face of Maybelline and Mavi Jeans. While pregnant with her second child with Serbian NBA player, Marko Jaric, she continued to model, and is featured in the 2013 Pirelli Calendar visibly pregnant. She is an industry unto herself. In amongst her many modeling gigs, and time with her family, she also volunteers for multiple charities and goes to church every Sunday. She looks incredibly glamourous when she is working, but when she is just driving around town running errands, she drives a fairly low-key car, and does her best to blend in. Adriana Lima drives a Porsche Cayenne Hybrid. 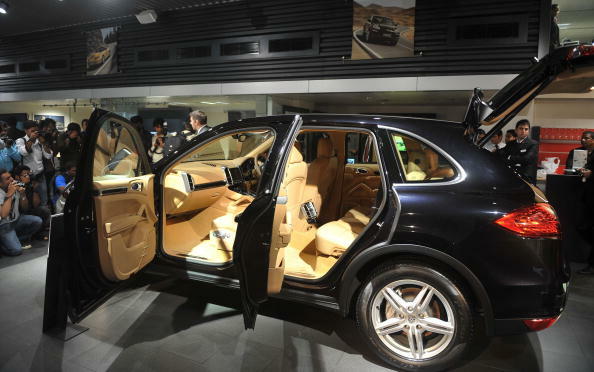 The Porsche Cayenne Hybrid debuted in 2005, but didn't go into production until 2010. The car has an electric vacuum pump, a hydraulic steering pump, and a 288-volt nickel metal hydride battery. The battery is housed in the floor of the trunk, where the spare tire is traditionally kept. The car runs on a 3.3 liter V6 engine which produces 330 hp, and a 47-hp electric motor. The combined horsepower is 380, and the car is the only Hybrid that can cruise at highway speeds using just the electric motor. The vehicle has many of the features that make the standard Cayenne so popular, including Porsche Stability Management, rain sensing wipers, LED running lights, seven airbags, power memory seats, and a Bose surround sound system. The Porsche Cayenne Hybrid sells for just under $70,000. This makes it a relatively modest purchase for a model whose mere presence in a jeans campaign increased the company's worldwide sales by 50%. Marko Jari? net worth: Marko Jari? is a Serbian retired professional basketball player who has a net worth of $20 million dollars. Marko Jari?